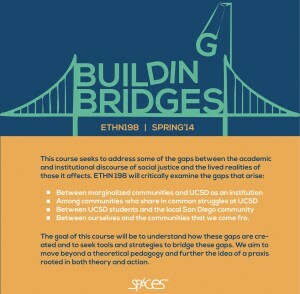 The Praxium Program is an initiative of the Student Promoted Access Center for Education and Service that serves as an opportunity to engage undergraduates with the diverse community within the university and in the greater San Diego region. The SPACES Praxium is designed to serve the mission statement of empowering students and developing student empowerment. 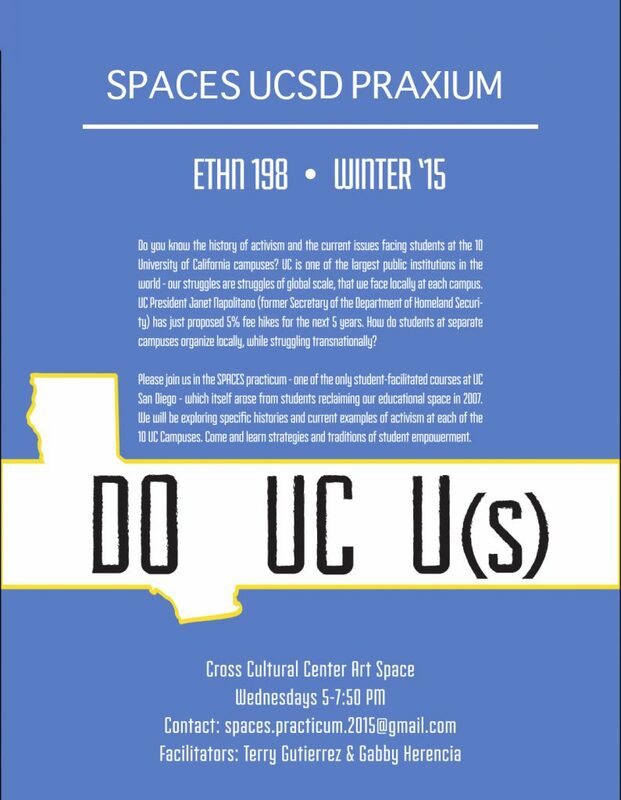 Through student-led lectures and/or group discussions students will critically examine the issues facing underrepresented students, gain an understanding of the student movement at UCSD, and most importantly- learn how to take action and make positive change. Emphasis will be placed on refining the knowledge and skills needed to carry out effective outreach and retention projects which include but are not limited to structural/institutional frameworks of racism/discrimination, inequities in education, basic counseling skills, and awareness of resources. What does resistance, empowerment, and cross-cultural coalition building mean? 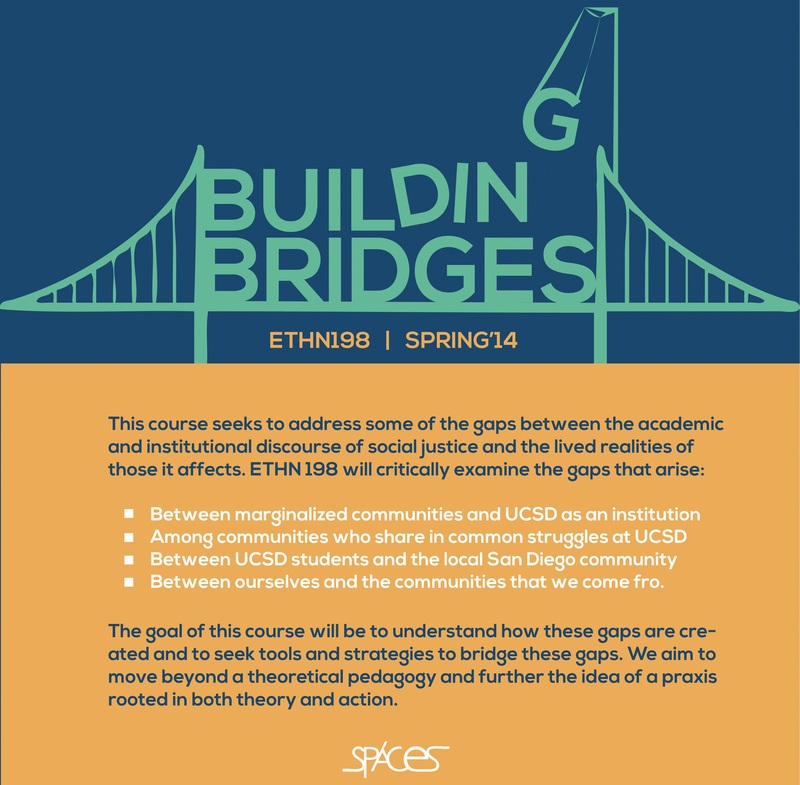 This course will be exploring methods of resistance from different communities within and outside of the U.S that are experiencing colonialism. 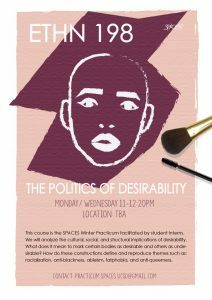 Additionally, this course aims to provide students the space to cultivate not only their own forms of resistance, but also a more holistic interpretation of colonial resistance on the individual, communal, state, and global level. 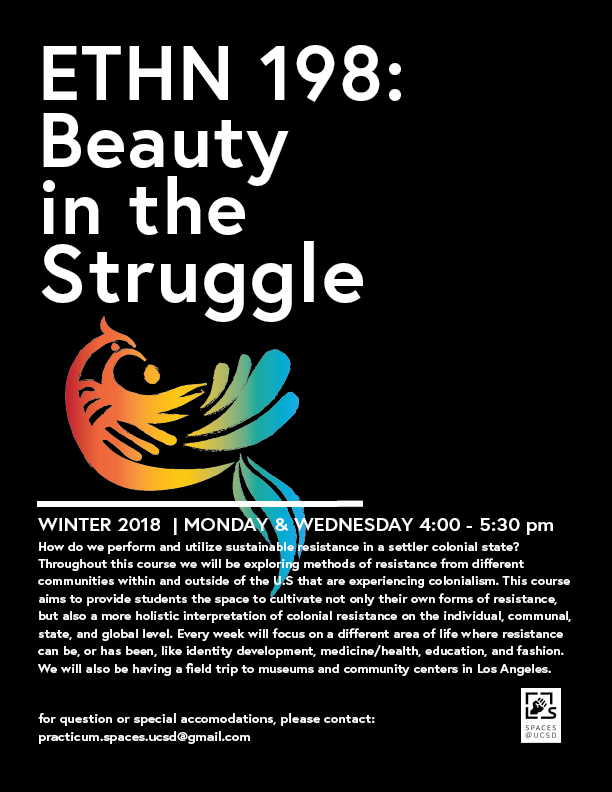 Every week there will be a focus on a different area of life where resistance can be or has been, like identity development, medicine/health, education, and fashion. 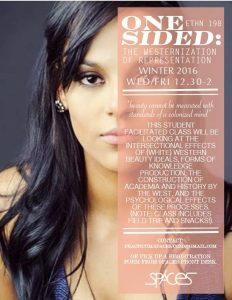 For more information, look at the event page. 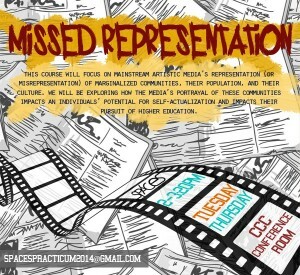 This course will focus on mainstream artistic media’s representation (or misrepresentation) of low income communities, their population, and their culture. We will be exploring how the media’s portrayal of these communities impacts an individuals’ potential for self-actualization and impacts their pursuit of higher education. We will compare and contrast examples of mainstream art and self-expressive art in order to critically analyze the process by which the art came about and the impact it has on the community it reflects. 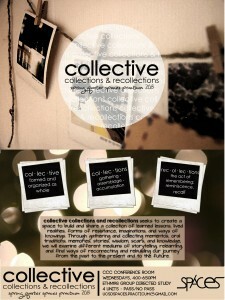 “Collective Collections and Recollections” seeks to create a space to build a collection of learned lessons, lived realities, forms of resistance, imaginations, and ways of knowings. Through gathering and collecting mementos, oral traditions, memories, stories, wisdom, scars, and knowledge, we will examine different mediums of storytelling, relearning and find ways of reconnecting and rebuilding our journey from the past to the present and to the future. As we explore and try to find our “place(s)” in society and our communities where we can exist in the midst of the margins, borders, boundaries, and beyond, we may find ourselves trying to discover and make sense of who we are — the self . Often times, in this process, we are misplaced – put in the wrong place and lost temporarily, we are displaced – forced to move out of our comfort zones, and we are replaced- substituted and no longer given a place. As these processes occur and take shape; this can lead to a detachment from the self as we are thrown in various directions and found at various intervals, rather than all together. 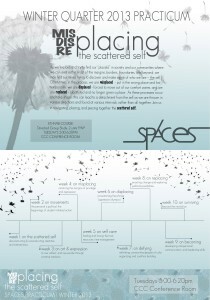 Join us in navigating, placing, and piecing together the scattered.